Sting once sang about being an Englishman in New York – so what’s the big deal about being an Australian (tourist) in Canberra? The buses! 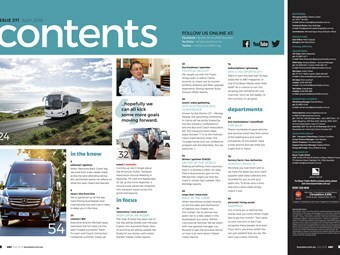 ABC issue 371 – Check out our exclusive look at the new Irizar i6S coach body. So, recently I attended the inaugural BIC 2018 Travel to Learn and School Bus Summit and second National Coach Connections Summit in Canberra. I must admit it’s been a while since I’ve been to downtown ‘Berra’, but I embraced that and found myself instinctively going into ‘deer in the headlights’ tourist mode. That is, travelling around city or place X with no idea what’s going on (okay, maybe a little bit), but just see how one would get from A to B using public transport. Anyway, I’m off my flight and I easily find the bus stop outside Canberra Airport. Must be luck of the draw, there’s a bus right there waiting and, better yet, she’s brand-spankers. Okay, maybe not right off the production line, but I’ve been in some rolling death-traps around the world, so trust me this thing was mint. It would turn out to be a Custom-bodied Scania, but at this point it was just a bus as I got aboard. How far’s the trip? Where are we going? Is there place for this packhorse to put his bags, suit and camera gear somewhere? Are the seats comfy? Do people look happy and comfy? Will I get there alive? And ‘are we there yet’? Standard questions. For the next 11 minutes along the 7.7km route – discovered not via google on the phone but by the beautiful and clear passenger information system screen up above – it was a blissfully uncomplicated and soothing journey. As, you know, theoretically … they all should be. I absolutely loved (and this is going to sound way weird, but you’ll have to be a bit funky with me on this) how the ‘bus spoke to me’. Okay, there I’ve said it. That is, I knew nothing but what the bus’s information systems gave me via accurate and clearly delineated data. Easy-to-read-yet-not-batpoop-boring maps, time calculations between stops, pleasant ambient lighting at dusk, and even the ads were good to check out. Right, that might be too weird, but truly I found it wasn’t so much entertaining me and competing with movies and audio many travellers might listen to on our phones on a trip, but more it helped draw my attention away juuuust enough from the motion and exterior sounds, mild engine noise and such of the bus. As an aside, I wasn’t that out of it after the flight to not notice we actually have a stop publicly broadcasting the location our primary spy agency, ASIO (shouldn’t those guys be working hidden away in a cave or something? ), but I guess if Casper was the friendly ghost, why not have a friendly and open security agency? Love it. While in Canberra, as mentioned, I attended the BIC Coach Connections Summit. Well, with two Summits run concurrently you’ve just got to just pop your head in back and forth if you wanted to check out both, but it was great to hear they’ve agreed to produce a Long Distance, Tour and Charter policy document that includes a 10-year plan to 2028 with the aim to double the number of trips taken by coach. I think this is great news and great forward thinking. In our May issue of ABC magazine, we looked at the new Daimler Setra not only for its pedestrian safety technology, but also what something of its ilk represented to engender greater coach patronage. The idea being, if you are going to win over hearts and minds to the bus-travel cause, why not do it in coach style? This issue, smack-bang in the middle of the book, you’ll find your complimentary 2018 Australasia Bus Conference program for the upcoming October 7-10 event in Cairns, Queensland. Around it you’ll find the rest of your favourite bus publication, featuring: an exclusive look at the new Irizar i6S coach body; an operator profile on Tropic Wings in … Cairns again, strangely enough; we take a Patico Automotive-tweaked Sprinter bus out for a spin; and grab another exclusive chat with industry champion Lou Riccardi, formerly of Asia Motors and now the GM of a new distribution entity for Daewoo buses here called Whites Commercial Vehicles. Nice one. Plus we’ve had a cracker of a month in terms of bus deliveries and there’s even a chance to win yourself a new HSV SPORTCAT+ 4x4 – how cool would that be? ABC Issue 368 – OUT NOW!